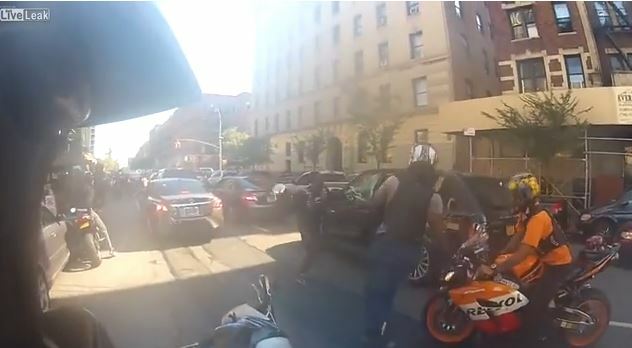 Bikers on Sunday afternoon 1st October attacked a SUV with a man and his family in New York City, scaring the family before dragging the driver out of the car and seriously beating him up. They attacked the SUV after the driver accidentally bumped into one of the motorists with his car. This is according to the New Jersey Herald. This biker crowd incorporated some gang members who encircled the man and started to beat him up while still in the SUV. The man had stopped to speak with the biker he had just hit when the gang bumped on him. The man fearing for his family’s life jumped into his SUV and took off. When doing this he accidentally hit two other bikers injuring them. The bikers chased the SUV driver for about two and a half miles forcing him to go off the road. They dragged him off the SUV and beat him up as his fearful wife watched in dismay. The incident is said to have happened around 1:30 pm along the West Side Highway while the accident involving the bicker on 125th street. The man was taken to hospital accompanied by his unharmed wife and child. The two motorcyclists the man hit were also taken to hospital; one had the two legs broken while the other one suffered a leg injury. Information from the police indicates that some of the bikers were from the Hollywood Stuntz gang. The man driving the SUV was not charged, but the police detained Christopher Cruz, 28, the biker in the first occurrence. He was charged with irresponsible driving, reckless endangerment, endangering the life of the child and mother. On Tuesday morning, Fox news said the police issued tickets to the bikers but it only appeared that one arrest was made. Defence Attorney Anna yum stepped up on Fox News live Tuesday morning to state that the SUV man was protecting his life from the gang. She said the man had every right to run from the scene, even if it meant running over the two bikers who were on his way. Police stated that they have all the evidence they needed involving the incident. 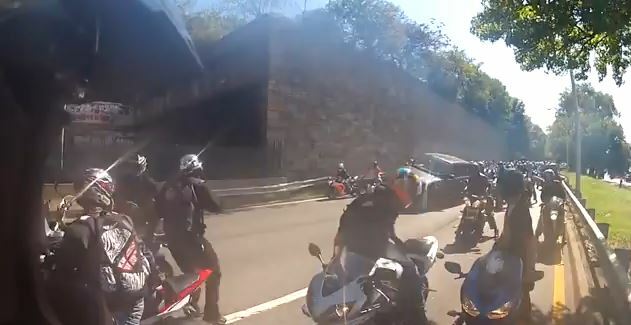 They were able to get a recorded video of where the biker was knocked over by the SUV, but he put his brakes on and pushed himself in the way of the truck as if he wanted SUV to bump into him. From the video it is clear that this biker group was looking for trouble. The motorists were part of the unauthorized bike rally where bikers gathered in NYC to ride through Manhattan on Sunday afternoon.